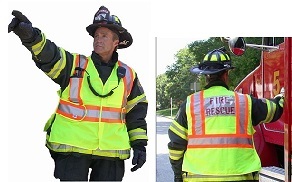 V1000 ANSI Class II Solid Lime Break-Away Safety Vest with 4-inch Orange/Silver Stripes, adjustable side-straps, pencil and expandable radio pockets, mic clip, Velcro front closure. One size fits all. Optional: Choose identification patch below.